A cup of tomato basil soup goes well with a grilled cheese sandwich, making a comforting meal, especially during cold winters. This side dish is rich in vitamin A and relatively low in calories. It will help you fill up without going over your daily calorie allotment. Versions made with chicken broth or low-fat milk are lower in calories than those made with heavy cream. 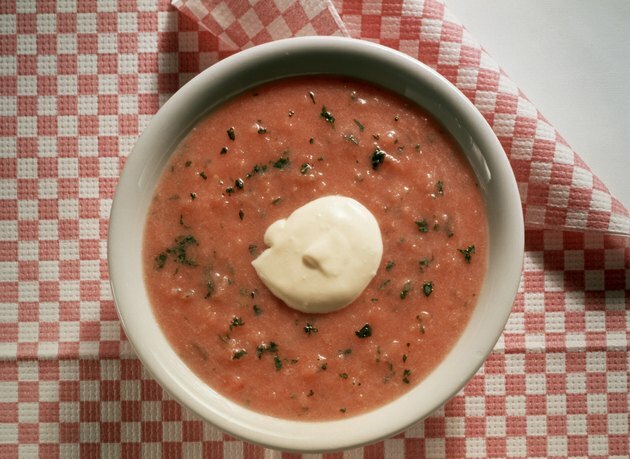 A cup of canned tomato basil soup has about 100 calories and is typically high in sodium, with 480 milligrams. A homemade version made with a mix of cream and chicken broth has about 180 calories per cup. Use nonfat milk instead and each serving of soup will have about 120 calories. Another version of this soup, made with a blend of carrots and tomatoes in a mix of water and reduced-fat milk, has about 139 calories per serving. You can also make a more filling version of tomato basil soup by adding chicken, navy beans and spinach for a dish totaling about 195 calories per serving.